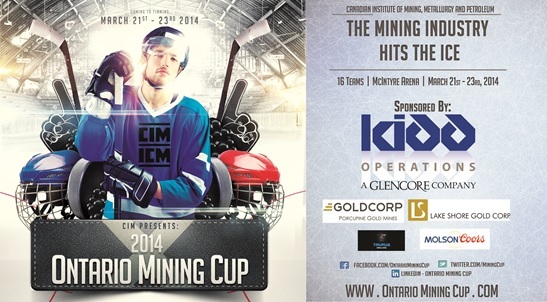 The CIM is engaging the Ontario mining sector to develop one of the premiere adult hockey tournaments in the region. Later this month 16 industry sponsored teams will compete for the coveted Ontario Mining Cup. The CIM is engaging the Ontario mining sector to develop one of the premiere adult hockey tournaments in the region. Later this month 16 industry sponsored teams will compete for the coveted Ontario Mining Cup. While the tournament serves to build fellowship amongst local mines, suppliers and industry partners it also represents a major fund raising event for the year. Thanks to the past success of local CIM events such as the annual golf tournament, curling bonspiel and steak & lobster banquet, the CIM Porcupine Branch has been able to open three mining specific scholarships. Our branch’s mission to create enduring value within the industry is being realized thanks to the support of our community partners and events such as the 2014 Ontario Mining Cup hockey tournament. The tournament will take place in Timmins,Ontario and will be hosted at the historic McIntyre Arena in partnership with the CIM Porcupine Branch. It will be a 16 team format and teams will be guaranteed 4 games. During the tournament there will be a beer garden set up Friday and Saturday evening at the McIntyre Arena for players and guests to relax and enjoy the atmosphere. There will also be a banquet Saturday night consisting of dinner, entertainment and awards for teams in various categories. The banquet is free for players registered in the tournament and free shuttle service will be available Friday and Saturday between arenas and hotels. The Ontario Mining Cup team would like to thank our Title Sponsor: Kidd Operations for their generous support. Other sponsors who have generously stepped up to help ensure this community event is successful include Banquet Sponsor: Taurus Drilling Services, Beer Garden Sponsor: Molson Coors, and gold package sponsors Goldcorp Porcupine Gold Mines, and Lakeshore Gold. With 11 of the 16 team registrations already filled by mining companies and mine operators from around the province, the tournament is quickly filling up. Several mining operations, suppliers, contractors and consultants as well as university mining engineering programs have contacted organizers for more information regarding the remaining spots, however spaces will only be reserved once teams have officially registered on a first come first served basis. If anyone is interested in becoming a tournament sponsor or registering a team they can contact tournament organizers Ted Hanley and Steve Black at info@ontariominincup.com.